brings together writers from three Atlantic countries ─Morocco, Galicia and Ireland─ aware as they are of the shared ordeal of migration and exile at different times of history. This feeling of dislocation is no doubt common to the people of Ireland, Morocco and Galicia due to their chronic experience of migration whether to neighbouring European countries or to more distant lands. The editor of the anthology, Dr Manuela Palacios (University of Santiago de Compostela, Spain), has asked seven poets from Morocco and another seven from Galicia to provide a poem on the topic of migration and exile, and then asked fourteen Irish poets to both translate the Moroccan and Galician poems into English and to write a response poem ―a good number of poems have been written expressly for this anthology. 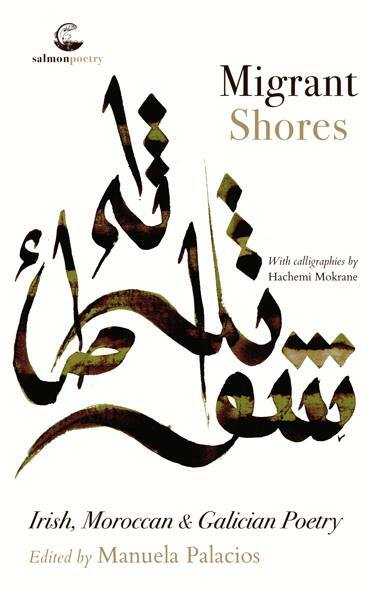 Migrant Shores attests to the rich variety of poetry in the three communities by including writers from different generations, male and female, many of whom enjoy the recognition of their consolidated writing careers, but this anthology also features new poets with their audacious proposals. The seven poets from Morocco are: Mohammed Bennis, Taha Adnan, Fatima Zahra Bennis, Imane El Khattabi, Mohamed Ahmed Bennis, Aicha Bassry, and Mezouar El Idrissi. The Galician poets are: Martín Veiga, Chus Pato, Eva Veiga, Baldo Ramos, Gonzalo Hermo, Marilar Aleixandre and María do Cebreiro. Finally, the fourteen Irish poets are: Paula Meehan, Máighrèad Medbh, Susan Connolly, Hugh O’Donnell, Catherine Phil MacCarthy, Sarah Clancy, Thomas McCarthy, Eiléan ní Chuilleanáin, Lorna Shaughnessy, Maurice Harmon, Celia de Fréine, Keith Payne, Bread Wall Ryan, and Mary O’Donnell.